If You Love to Sing, We've Got a Place for You! The members of Sweet Adelines International are an amazing group of real people, singing real harmony and having real fun today! 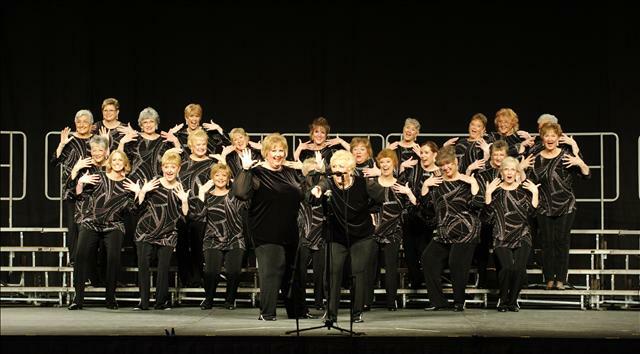 Sweet Adelines International is a worldwide organization of singers that meet regularly to practice, socialize, perform and sing a cappella harmony, barbershop style. We are looking for singers to join the thousands of members who value the joy of singing chord-ringing, fun-filled music. Sweet Adelines choruses and quartets perform four-part a cappella harmony, barbershop style. Whatever tone your voice, there is a singing part for you. The music includes special arrangements of today’s ballads and upbeat songs, popular show tunes, and even jazz. Members say that singing the satisfying sounds of barbershop harmony provides a rich, rewarding experience. Members of Sweet Adelines International share fun social activities, an enlarged circle of friends and exciting performance opportunities. Discover why thousands of people around the world are singing the praises of Sweet Adelines International. We have a spot on the risers reserved for you!